Involving cartoons and superheros, this is one gift kids can really get excited about. It's also one that parents can get excited about, helping kids happily work on a slew of important skills, handwriting and storytelling among them. Insert Dad as the hero of the story, and you'll have one very memorable and hilarious Father's Day gift. Start by drawing your comic book pages. 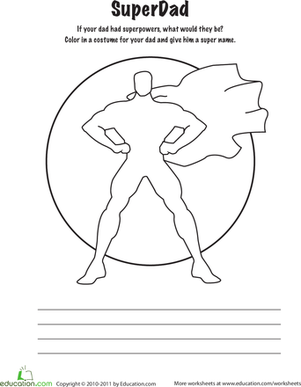 Use small and large squares to create a comic book template that your kids can fill in with their own creations. Depending on how old your child is, you may want to add more or fewer visual cues, such as text bubbles to remind her to add conversation. Be creative: try varying the size of the squares and leaving some pages blank for full page drawings. You probably want no more than four or five pages, plus two blank pages (one for the front and one for the back covers). Punch five evenly spaced holes along the left side of the book with the small hole punch. Sew the book together using the needle and a double strand of thread, doubling your needle back between the two strands to secure it. Use a backstitch to sew up and down the spine. To tie off the thread, run the needle between the strands, cut the thread, and tie the two strands of thread together in a knot. Trim off the excess. Hand it off to your child. Does he need help getting started? Offer this as a writing prompt: Imagine that your dad is a superhero. What super powers would he have? What would his superhero costume look like? What evil forces would he have to battle? Imagine that your dad is driving to work when suddenly one of the bad guys attacks! What happens next? 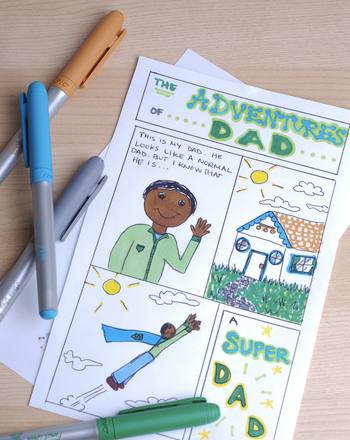 Use pictures and word bubbles to tell the story of your dad's adventure—and don't forget the happy ending! You can make a stack of these pretty easily, and your kids will fill them up in a flash. Keep a supply in the art box for impromtu cartoons whenever creativity strikes!